Start your Halloween off with a bang! 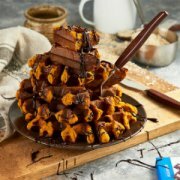 Scrumptious Halloween waffles, suitable for breakfast, lunch, pudding, or all three! Who needs tricks when you have treats like these! 1) Pre-heat the waffle iron. 2) In a bowl, mix together the whey, instant oats, baking powder and pumpkin spice. Add the canned pumpkin, liquid egg whites and Flavdrops and mix to form a smooth batter. 2) Spray the waffle iron with 0 kcal spray and spoon a couple of dessert spoonfuls of the batter and leave until fully cooked throughout.